TWO teenagers have died after the car they were in hit trees in Hampshire. Officers were called just before 5am today after a member of the public reported seeing a vehicle on the side of the eastbound A30. 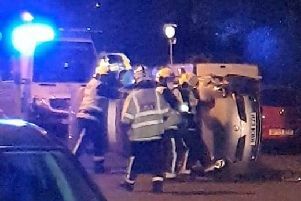 The car, a white Fiat 500, had hit trees just past the Hatch pub and the driver of the vehicle and her passenger, both 18-year-old women, were pronounced dead at the scene. Their next of kin have been informed and are being supported by specialist officers. Investigations into the circumstances of the collision are ongoing and the road is still closed. Sergeant Andy Noble, from the Joint Roads Policing Unit, said: ‘We are working hard to establish exactly what happened to cause this collision. ‘At this stage we do not know what time the collision happened, so we would like to hear from anyone who drove eastbound along that road between 9.50pm last night and 5am this morning. ‘We particularly want to speak to anyone who has done that journey who has a dash cam, as we believe this will help us to narrow down the time of the incident. If you have any information relating to this case, please call 101 quoting reference ‘44180114591’, or contact Crimestoppers anonymously.